Signup for our newsletter to get notified about new reviews and discounts. The EastPoint Sports 54 in. Newcastle Foosball Table is another table available in the market that has people asking if it’s really worth the buy. Based on the description provided by the manufacturer, it can provide hours of long-lasting fun. The table is competition sized and good for 2 to 4 players with robo-style plastic men to kick the ball around. There’s also a bead-style sliding scorer to keep tabs on who’s winning. The table’s steel rods are equipped with high performance bushings for easier spinning and sliding. The description also notes that the table design is durable and sturdy, and carries a “Luster Long” finish to prevent wear and tear. The oversized leg levelers really help keep the playing surface as uniform as your house’s foundation (at least I hope) . At 83 pounds, it wouldn’t be shocking if the EastPoint Sports Newcastle foosball table was made out of something less durable. Yes, medium density fiberboard is pretty standard for a foosball table. The thing is, they have the tendency to absorb moisture and are susceptible to scratches and nicks as time passes. Signs of abuse and aggressive play get revealed more easily on an MDF based table. With that said, even some of the more expensive options opt to use MDF. The difference here is on the thickness and this table comes up on short end of that battle. The overall weight of the table can give quite a lot of information about the quality of the materials used in its fabrication. The heavier tables often indicate higher quality materials. This table comes in on the heavier side of the lightweight tables. It doesn’t quite break the century mark, but for a lightweight table you are probably getting one of the more sturdy options. Most experts and tournament players of foosball would prefer a table that’s closer to 150 lbs or higher. The steel rods are a nice touch and seem to hold up to normal wear and tear. Its table top players are those of the “robo” style. They have a more block style shape that’s great at resisting long-term damage. 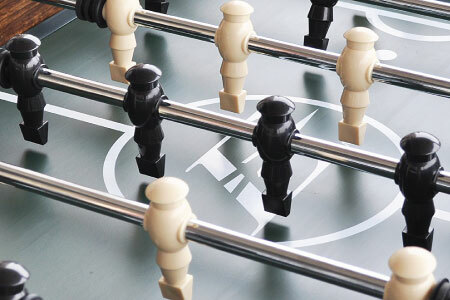 The EastPoint Sports Newcastle Foosball Table carries the “Luster Long” finish for all around better resistance. This is a nice surprise as it’s not something that you usually see on more affordable tables like this one. This feature actually improves longevity of the table quite a bit. As mentioned above, the EastPoint Sports Newcastle Foosball Table is a relatively light table. As expected, it is more prone to movement during gameplay, especially if both players are in the heat of battle and focused getting every last pound of torque on their shots. Again, don’t expect this table to stay still if you’re competitive. This table is a few inches smaller than tournament grade foosball tables so don’t expect to be seeing something like this on your local tournament tour. The table’s rob bushings are designed to be high-performance and were engineered to function smoothly while turning. Remember, cheaper tables usually come with rods that feel rough during turning and are inconsistent, so this is a very nice touch. One complaint we had is that this table’s leg levelers are oversized, but this doesn’t really provide much stability for gameplay. While it does provide a level surface for gaming, we had really hoped that the feet could add a little more stability to the table. The ball returns aren’t on situated on the sides of the table which can be a hassle. Most players won’t have an issue. The robo style players are not counterbalanced, making it difficult to keep them stable and providing less power on shots. 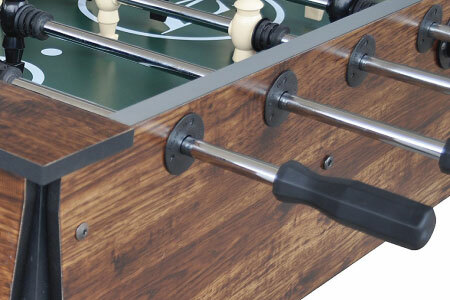 The EastPoint Sports Newcastle Foosball Table’s faux wood finish makes it look like it’s a high end table. At first glance, you may expect it to be closer to an upper echelon table. Overall, we would say it has a minimalist style, that can work in any office, gameroom or bar alike. Calling it an aesthetically pleasing table would not be a far stretch. It is far from an eyesore, so it scores some points there. This table is recommended for players of all ages. Highly competitive foosballers and serious players in general may want to shy away. This is perfect for someone who wants something that they can afford, but still wants a little bit more quality than other competitively priced tables. 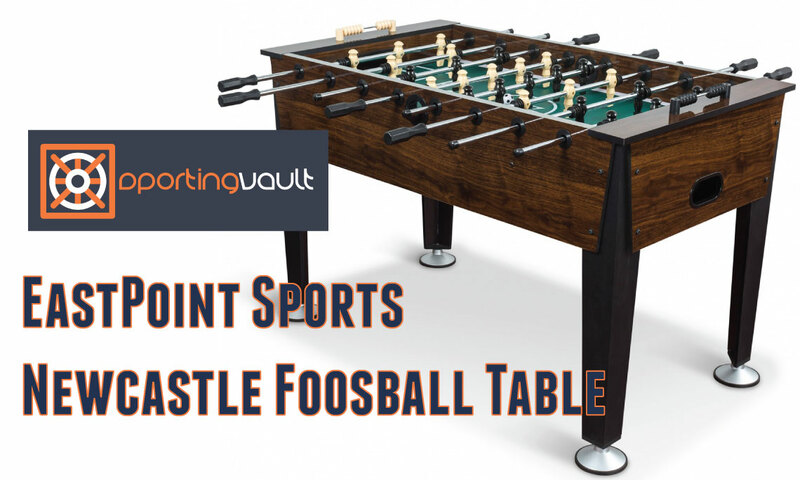 If you don’t mind some minor issues, than you can go ahead and take a stab at the EastPoint Sports Newcastle Foosball Table for yourself. While it’s not going to break apart after a few aggressive rounds, it’s still better for longevity if you try your best to avoid taking your anger out on the table like you did to your Xbox controller. With proper care of this table, you can definitely end up getting hours of fun and provide some great quality time between friends and family. This entry was posted in Foosball Tables, Leisure Sports & Game Room. Bookmark the permalink. Lover all of things sports and internet. Sporting Vault is a participant in the Amazon Services LLC Associates Program, an affiliate advertising program designed to provide a means for sites to earn advertising fees by advertising and linking to Amazon.com.